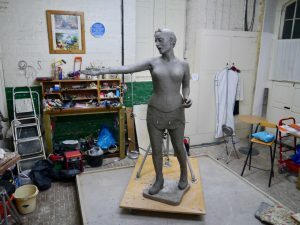 In early summer, Councillor Andrew Simcock (Chair of the Emmeline Pankhurst Statue Campaign), Manchester City Council women councillors and women from the SafeSpots charity visit my studio to see the clay Our Emmeline in progress (filmed by Huckleberry Films). Sharing Our Emmeline with these strong Manchester women was a real privilege – they asked some very insightful questions and were very positive about the work-in-progress. It really boosted my spirits and gave me a lot of encouragement, to continue working on the clothed figure with Sarah. Sculpting a large figure is like an endurance sport – you have to pace yourself and seek encouragement and advice when needed. Our visitors came just at the right time. I am lucky to have the professional input of fellow sculptor Marji Talbot, who pops in several times across the project to give some critical input and to be a sounding-board for questions I’m tousling with.